Trekking is an adventure! For the uninitiated, this active pursuit involves lengthy, multi-day walks and climbs on village and park trails. 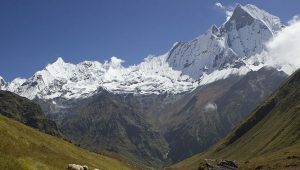 The terrain is usually fairly steep, and we will likely encounter snow at higher altitudes (those above 5,500m/18,000ft). What is the difference between trekking, hiking and mountain climbing? You can do all three activities in Nepal, but they are quiet difference things. Trekking is a multi day walk, where you stay overnight(or several nights) at the place you’ve walked to. Hiking generally refers to a one-day walk. It might be two hours or eight, but if it takes place within single day.it’ll probably referred to as a hike. Mountain climbing is another thing entirely. It takes special equipment, training, and comes with more risk. Neither trekking nor hiking require any special skill, other than the ability to walk. We like to think trekking is for everyone who is physically fit, patient, and loves the outdoors. Are there any age limit for Himalayan trekking? Nepal law requires that children under age 18 are accompanied by a parent or guardian while trekking. There’s no upper limit on our adventures, as long as participants are healthy and willing! 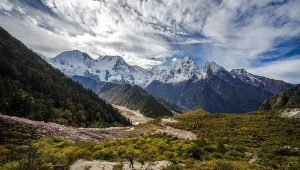 Is previous experience necessary for trekking in Himalayas? In theory, no. Anyone with robust cardiovascular capability and good stamina should be able to cope with higher elevations and lower oxygen density. Trekking or hiking experience anywhere in the world is strongly recommended for maximum enjoyment of your Himalayan adventure, however. It depends on the specific trek, and, to some extent, on the preferences of those trekking. We offer all sorts of treks, ranging from easy to difficult. Why is guide necessary?, I can’t guide myself? While it is not a legal requirement, we cannot overstate the importance of trekking with a licensed, experienced guide. You’ll be traveling through wilderness, remote countryside, and high elevations – from an aspect of pure safety, it is highly dangerous to go it alone. Additionally, very few locals in Himalayan villages speak English. Should you get lost (and, with many paths crossing through many, many villages, this is more a likelihood than a possibility), it would be difficult to communicate directions or obtain food and shelter. Additionally, our guides are experts in Himalayan treks with an average of over 15 years trekking experience. No matter how confident you feel in your skills or knowledge, it is almost certain that we can help enhance your experience. You will either stay in lodges (tea houses) or in the more remote area, Tents. Most lodge accommodation is simple but clean and comfortable. Luxury and homestay options exist on some routes. In most places you will get a variety and can choose from the menu: pasta, Momos, Dal Bhat and veg curry are all common. For breakfast: pancakes, porridge, eggs, and potatoes. What type of insurance should I have? Travel insurance is mandatory and obtaining for the days you are trekking is your responsibility. We suggest our guest as it covers Helicopter and medical evacuation up to 6000m. Some standard policies only cover up to 4000 meters for evacuation so please confirm with your insurance company if you purchase it from another company. If you get to Nepal and don’t have insurance already we can help you purchase it for a reasonable price before you start the trek. How we will deals with altitude acclimation? We take all possible precautions to proactively ensure the safety and wellness of our trekkers, but rest assured that our guides are trained and experienced in dealing with emergencies. Each guide is trained in first aid. In the case of altitude sickness, you will immediately be taken to a lower altitude. If necessary, your guide will utilize your travel insurance information to call a rescue helicopter, and you will be flown to Kathmandu or Pokhara for medical attention. What happens if I got sick or injured while trekking? Can I get a refund if I don’t finish the trek? Are there any permits required for trekking? It depends on your specific trek. Some trekking areas require a special permit like upper mustang, Manaslu, Dolpo, ( restricted are permit) for trekking, while as others require only permits to enter conservation or national parks. Most require a Trekking Information Management System (TIMS) card and National park permit. We handle all permits for you, so you have one less thing to worry about! Your specific trek and the time of year during which you depart will greatly impact your packing list. A recommended outline of clothing and equipment is listed with each trek. In general, a down jacket, a warm fleece jacket, thermal underwear, trekking pants and shorts, and sturdy boots are recommended to wear, and a thermal sleeping bag, backpack, and camera are recommended for your kit. If you take any medication, this should obviously be a packing priority. Utilize common sense – you don’t want to end up short-handed on the mountain, but overpacking is undesirable. It’s worth noting that just about anything you need in the way of trekking clothing and/or equipment can be purchased or rented in Kathmandu when you first arrive. Nepal is mostly safe from theft but it might be good idea to carry one of these best anti-theft backpacks for travel. What does trekking grade (easy, moderate, difficult and strenuous) means? Grading” is a term used for rating treks based on difficulty. According to Himalayan Glacier standards and experience, we have divided the trekking into four types, namely Easy, Moderate, Difficult and Strenuous- the challenge in terms of both technicality and geography increases as we move higher in that order. Thus, Easy Treks could be suitable for all while Strenuous and Difficult Treks are meant only for those who have certain experience and capability. This can help you choose a trek or climb especially in the Himalayan Region that best suits your fitness level and experience. Please keep in mind that this is a general guide only. A variety of factors, including weather, may add to the challenge. No previous trek experience and any physical preparation are required to attempt this trek. An interest in walking will be enough to take up such treks. 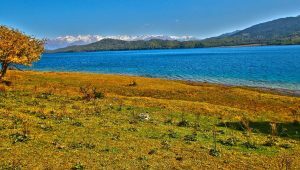 Such treks usually vary from 2 days hike to 5 days trekking and can reach up to an altitude of 3000 m. Treks usually on well maintained paths and passes through ridges and involve walking up to 5 hours a day. 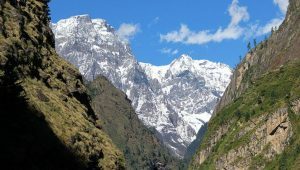 Moderate Treks will require at least 6-7 hours of walking every day, crossing 4000 m above high altitude passes, and long and exhausting walks through often rough trails, rocks and boulders. Therefore, you will require physical and mental fitness, positive attitude and interests and previous hiking or camping experience is preferred. You should prepare to face high altitude. Previous trekking experience and technical knowledge is essential in Difficult Treks. Besides walking through rough trails for 6-7 hours and crossing high passes as high as 5000 m, you will also be glacier crossings on snow/ice. You will be facing high altitude air with low level of oxygen and continuous walking over huge stretch of Himalayan valleys. Positive attitude and perseverance is required. Strenuous Treks involve long days, long hours of challenging walks, high altitude passes above 5000 m, difficult terrains and glacier and snow walking. No doubt you need to be mentally and physically fit and in excellent health condition. As part of technical requirements, you will require to have rock and ice climbing experience with the knowledge of use of ice axe and crampons. You should consider joining one of the rock climbing and glacier walking classes prior to heading for Trek.